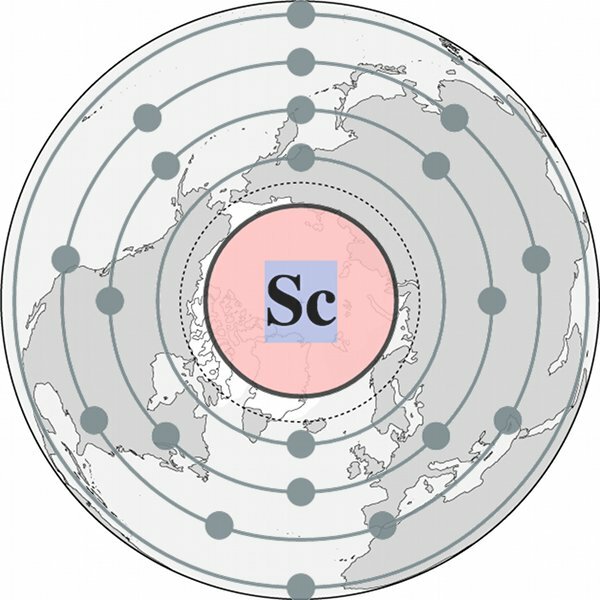 Scandium in the Arctic. © Mia Bennett. Adapted from Wikipedia and World Atlas images. I attended the American Geological Union (AGU) Fall Meeting this week in San Francisco. It’s billed as “the largest worldwide conference in geophysical science,” with over 20,000 attendants. There was a vast number of talks on the cryosphere, which I’ll try to cover over the next few days. One session I attended, “Frontier Science from Extended Continental Shelf Studies,” included talks presenting the results of ocean-going expeditions by countries such as Japan, New Zealand, Russia, and the U.S. While most of these cruises’ priorities were to map the continental shelf, they generated many side benefits in the form of new scientific discoveries. In effect, on these cruises, geopolitics was fueling geoscience. He discussed the findings from cruises of the USCGC Healy in 2008, 2009, and 2012, which were intended to jointly map the continental shelf with the Canadians. Scientists collected ferromanganese crusts and nodules and found that the Arctic Ocean notably differed in chemical composition from other oceans. The results regarding the presence of ferromanganese was not terribly exciting, nor were the findings specific to cobalt, copper, nickel (whose extraction has the potential to generate rare earth element byproducts) and rare earths as a whole – all of which were higher in other oceans. Scientists did, however, discover that the crusts and nodules they collected were the only ones from the global ocean enriched in scandium (Sc). Scandium is a silvery-white metal that is sometimes classified as a rare earth element, and it is often found near other rare earth elements and uranium. At present, there are reportedly no active scandium mines, as the Zhovti Vody mine in Ukraine was flooded years ago . Instead, scandium is generally produced as a byproduct from uranium mining in places like Kazakhstan and mine tailings throughout the former USSR, which used the element for military purposes. Commercially, the aircraft industry is interested in scandium, as it is similar to titanium, the metal out of which most airplane bodies are constructed. Scandium has a high melting point and is resistant to corrosion like titanium, but it is significantly lighter. Scandium can also be used in manufacturing reinforced aluminum alloys (scandium-reinforced aluminum)  and in x-ray tubes. 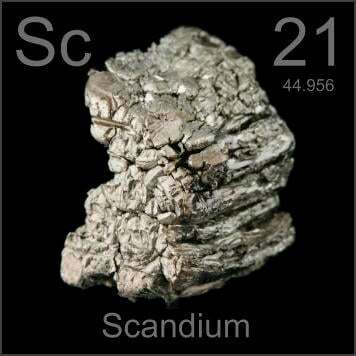 Trade in scandium is extremely small in volume, as only about 5,000 kilograms a year are used. Yet the amount of money exchanged for such a small quantity is stunning, as scandium fetched $15 million per ton in 2013. The International Seabed Authority grants deep-sea mining leases for areas outside of exclusive economic zones. Most of these leases have been made in the Pacific, specifically in the Clarion-Clipperton Fracture Zone. The New York Times has a useful map from 2012 of deep sea mining activities. Given the shortage of rare earth elements on land in part due to China’s decreasing of its exports from its Bayan Obo mine, the world’s largest rare earth element mine, deep-ocean deposits have been considered as a potential alternative source. No deep-sea mining leases have been made in the Arctic, but discoveries such as these latest results on scandium will likely add to excitement about the future potential of the industry on the high seas. In any case, mining could start much sooner within the existing territorial seabeds of the Arctic littoral states. The first use of scandium-reinforced aluminum was on the nose cones of Soviet ballistic missiles. 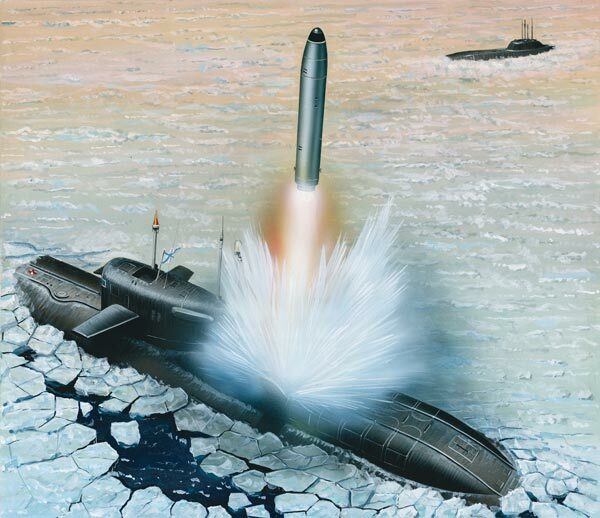 The alloy allowed the Soviets to launch missiles from submarines that could slash up through the Arctic sea ice from below, emerging damage-free and ready to strike. I suppose the first application of this alloy is appropriate given the recent discovery of scandium-enriched crusts in the Arctic. Let’s just hope that if mining proceeds in the years to come, more useful applications will be made than furthering the arms industry, least of all in the Arctic. This is especially the case given the region’s fragile environment and the little scientific knowledge that exists about the deep sea. Mining for minerals inevitably comes at an environmental cost, one which would not be worthwhile if the only use were for advancing the destructive capabilities of military technology. Illustration of Soviet submarine and missile. © Bokryt Cveta magazine. Duncan, R. 2008. Elements of Faith. New Leaf Publishing Group: p. 46.